There’s nothing better than getting outdoors, feeling the sun, wind or even rain on your face as you explore Ireland’s spectacular scenery. We have hand-picked our top five walks on the Emerald Isle, so all you have to do is get your walking shoes on and get out there and enjoy. Fancy getting away from it all and being at one with nature? The scenic Mourne Mountains, just 50km from Belfast are a perfect escape from the stresses of modern life. Boasting Northern Ireland’s highest mountain, Slieve Donard at 853 metres, the Mournes have it all; challenging peaks, gentle slopes and crystal clear lakes. The starting point for all walks is the Donard car park in Newcastle, where you can walk on clearly trodden paths which follow the river, as you descend higher and higher up the mountain. The path is to the left of the river and passes tumbling waterfalls and breathtaking scenery as you follow the the dirt trail leading towards the Mourne Wall. The dry stone wall is a good guide if map reading isn’t your forte. 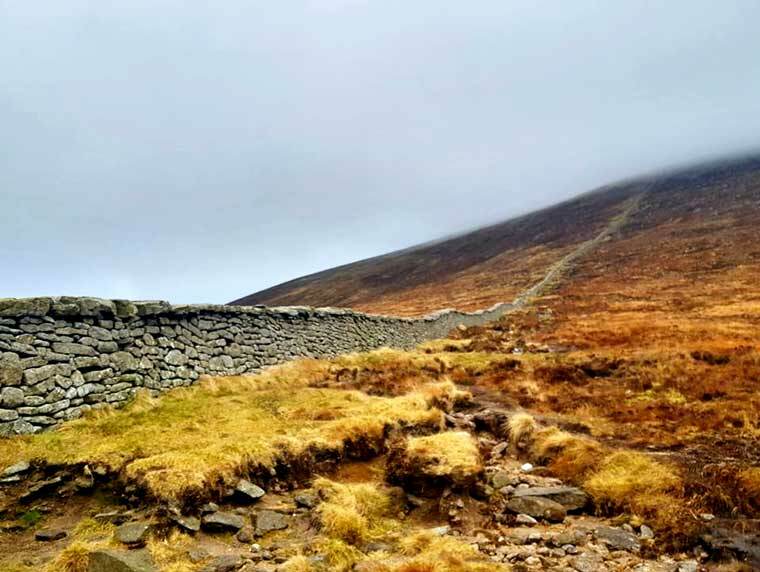 At 35km long, the Mourne Wall is among the most famous features in the mountains and took over 18 years to build. It was constructed by many skilled local people between 1904 and 1922. While the wall provides a slight break from the wind, be prepared for some serious wind chill coming in from the Irish Sea and pack accordingly. From the carpark to the top of the summit will take about 2 hours and 30 minutes so be sure to pack layers and plenty of snacks to enjoy. 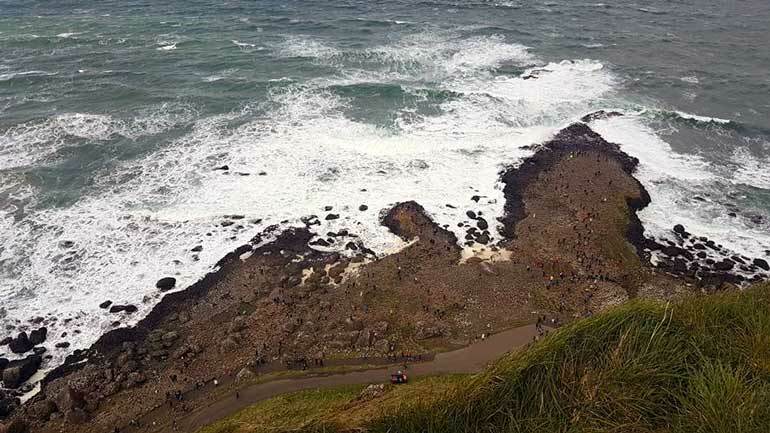 The Giant’s Causeway Cliff walk is one of Ireland’s most visited attractions and it’s a hidden gem for those looking to experience stunning birds-eye view of the causeway. The causeway has been upgraded and the walking trails include four signposted walks which are suitable for all abilities. We suggest taking the red route for the best views. When you reach the summit, you will be rewarded with spectacular views over the causeway pillars and see the swells rolling in from the Atlantic below. The walk takes approximately two hours which will give you plenty of time to stop and admire the scenery and experience the causeway itself. The trail can be challenging, so hiking boots would be recommended, or at least bring a change of shoes. When you have finished the walk, stop at ‘The Nook’, a beautiful little restaurant just before the entrance to the Causeway centre, which serves homemade soup and brown bread. We highly recommend stopping here! At over 601 metres high, the Slieve League Cliffs are the highest sea cliffs in Ireland and perhaps its best kept secret. The cliffs are about 40 minutes by car from Donegal town and well signposted. You can park your car in the lower carpark and make your way up the precarious path to the top. Along the way you can admire the beautiful coastline but what’s really special about Slieve League is that you can explore at your own leisure. 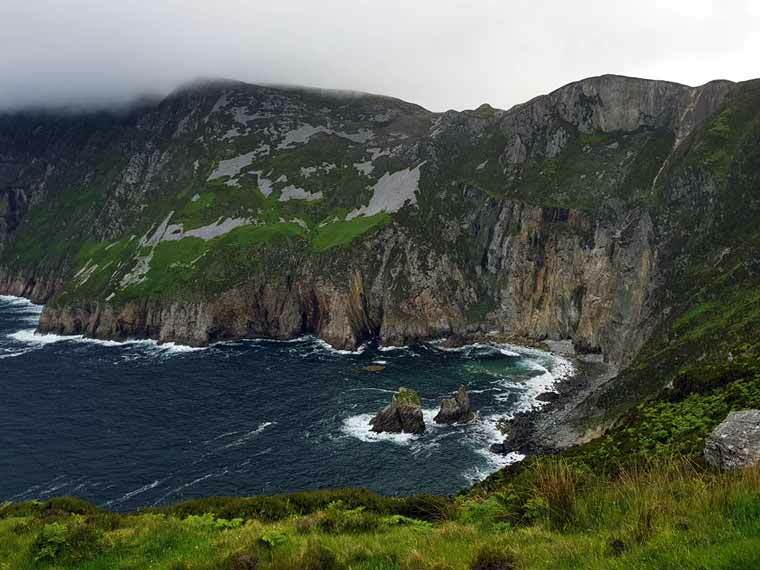 As you walk towards the top of Slieve League, the cliff face rises to a peak of over 600m. The cliffs themselves are breath-taking and for the more adventurous the path continues all along the coast with steep elevations in places but the view makes it all worthwhile. Take a short detour on your way to the top view point and see the castle perched on the cliff top. Upon reaching the top you will enjoy stunning 360 views of Donegal, Sligo & Mayo. Experienced walkers only should venture beyond the viewing point onto ‘One Man’s Path’, which loops around onto the ‘Pilgrim’s path’. During the summer months, the top car park has a coffee and tea van, a perfect place to enjoy the view. The whole walk takes approximately 40 minutes each way to the top view point. Perhaps Irelands most ‘instagrammed’ walking trail, the ‘Stairway to heaven’ has had a huge surge in visitors over the last 12 months. The start of the walk is in a small carpark ( check www.marblearchcavesgeopark.com for opening times) with a map of the trail walk just past the Marble Arch caves. 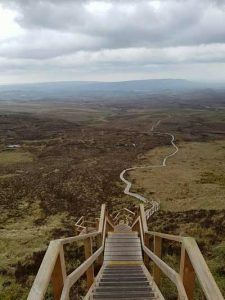 The whole walk has a mixed terrain of farm road and a beautiful wooden walkway that leads to an incredible wooden stairway which goes all the way to the top of Cuilcagh mountain. At the peak you will enjoy stunning panoramic views of Fermanagh, Leitrim & Cavan and take in views of the beautiful lake located at the bottom of the staircase; a perfect photo opportunity. Make sure to bring a backpack with extra layers as the weather is temperamental throughout the year and the winds can get very cold. The walk is for all abilities and will take about four hours for moderately fit people allowing time for breaks and of course to take the obligatory photos. 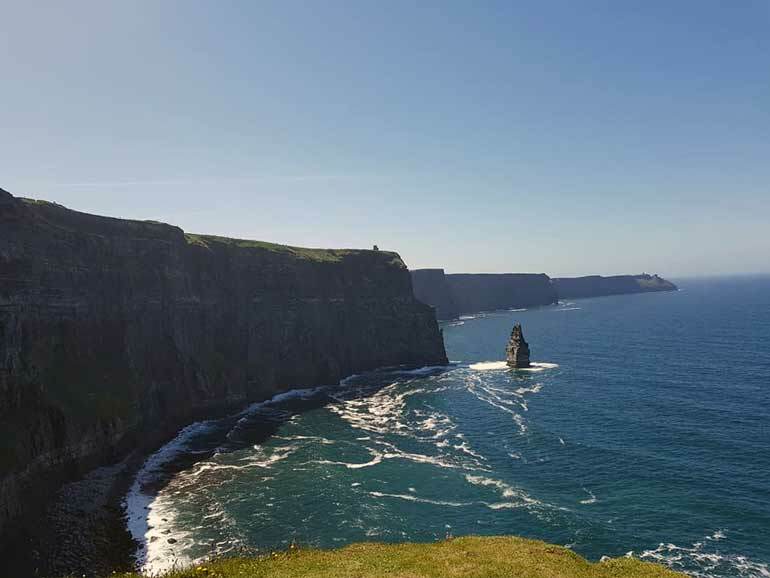 This 18km cliff walk is certainly a challenge, but time will fly by as you admire the wondrous Cliffs of Moher and the views across the sea to the Aran Islands. Start your walk in Doolin village where you can park your car. Walk across the bridge, heading right up the hill to the walks’ starting point at the farm gate. This is well signposted. The first part of the walk will take you through farmland. It is a clear well-trodden path, which will take you past livestock, horses, Burren birdlife and you might even meet a friendly farmer on the way. Although the start of the walk steep incline, this flattens out after about 30 minutes and you can enjoy a more leisurely pace, taking in the views of the Cliffs, Hags Head, the Aran Islands, Galway Bay, O’Brien’s Tower & the Atlantic ocean. Make sure you take a snack with you and plenty of water or you can stop at the Cliffs of Moher Visitor centre for some refreshments before continuing your journey onwards to Liscannor. Once you reach Liscannor, you can catch the shuttle bus back to Doolin, This services runs every 20 minutes in the summer, but check online on www.cliffsofmohercoastalwalk.ie for up to date schedules and cost. Doolin is the perfect place to unwind after your walk, with lively Irish music in most pubs and a good variety of places to eat. We highly recommend staying in this gem of a village.